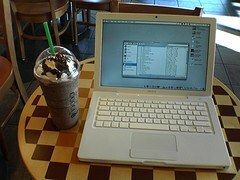 I actually DO blog from Starbucks! I guess that makes me a coffee shop blogger. Sounds a bit cliché, I know, and I’ve at least implied having done it there in the past. I mostly blog from home, but I’ve done it from airports and hotels and while away on vacation, and pretty regularly at Starbucks. There’s something about the atmosphere at Starbucks that stokes the creative juices. Perhaps it’s the buttoned-down attire and casual attitudes of most of the patrons. Maybe it’s the eclectic music playing in the background. And then again, it might be the fact of being out and about where people are coming and going. Or even the quiet conversations you can’t help overhearing. All of it combines to give a writer inspiration and ideas, in much the same way that a beach scene, a mountain-scape or a quaint old town might inspire a painter. It’s also a convenient escape hatch for those days when you’ve had a little too much work-at-home—yes, that does happen. The blogging-from-Starbucks bug might have bit me sooner or later, but how I started doing it was actually an accident. My friend Dave Kelly and I were both trying to get out of the mortgage business even before the mortgage meltdown of 2007. We started getting together, eventually on a weekly basis, for coffee talks, often at Starbucks. A one word text or email would go from one to the other—“Coffee?”—and we each knew exactly what that meant. We’d get together and talk about how much we hated the mortgage business, how much we were committed to leaving it, what our new business ideas were, and to report on our progress in making our dreams a reality. Dave always wanted to be a professional speaker. He had been doing speaking for many years without getting paid for it—he wanted to change that and turn it into a paying career. I always wanted to be a writer, but that wasn’t remotely a part of any job I’d ever done. Writing and speaking gigs aren’t typical jobs, and you won’t find much in those fields in your friendly, neighborhood want ads. I’m sure that to a lot of people who saw us at Starbucks—especially those who saw us regularly—thought at the time that we were part of the then growing ranks of “coffee shop slackers”—the otherwise unemployed who hang out at Starbucks pecking on their laptops trying to look as if they’re doing something productive but really aren’t. If that’s what we were, it was only temporary. We spent a lot of time bouncing ideas, sharing resources, developing plans and commiserating over being middle-aged and in the middle of a career crisis. It took a while, but we both got what we wanted—we got our career transitions and are now doing what we love to do. Being at Starbucks had something to do with that. I learned a few things from being at Starbucks. If you want to change your life, you have to change what you do. Meeting at Starbucks, as ordinary as it sounds, took us out of the offices, cubicles, meetings and mountains of paper work that our mortgage careers had us buried in, and moved us into an environment that was different in every way. When you change your physical environment, you begin to change your outlook and eventually your circumstances. Career transitions behind us, Dave and I continue to meet at Starbucks every couple of weeks, only now we work on tasks that are part of our businesses. Armed only with our laptops, and dressed in shorts, tee shirts and sandals, we have working coffee sessions where we mostly write and correspond, in between exchanging new ideas with each other. Am I gloating about being able to work from Starbucks? Yeah, I think I am. But every career has it’s pleasures and pitfalls, and this one is worth bragging about. It’s one of the perks of being a writer, blogger or blog writer, and one worth celebrating. I’m no longer a coffee shop slacker, but a coffee shop blogger—at least whenever I feel like it! Freelance blog writing isn’t just a career, it’s also a lifestyle, and one with a highly flexible work-style. As a freelance blog writer you really can work anywhere you like. It can be at Starbucks or any other coffee shop, as well as a restaurant, hotel, the library, your home office or even at poolside. Or yes, even the beach, the mountains or a foreign country. Freelance blog writing can be done anywhere there’s an internet connection. And anywhere you’re happy working. 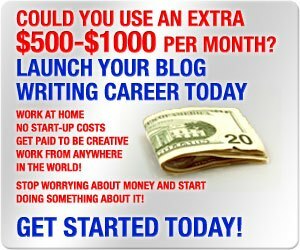 Check out The Freelance Blog Writer Side Hustle if you’d like to give blog writing a try. You can start out doing it part-time and, if it works for you, build it up to a full-time business. And if you’re looking to balance it with other income sources as part of a multiple income strategy, it can work well for that too. I find that it’s easy to get creative when you’re out and about at a coffee shop or restaurant where there’s Internet access. Something about the atmosphere, the hustle and bustle and the change of scenery just combine to get those juices flowing. I don’t do it as much as I might like, but it does help when I do. Hi Pete–I try to make it a point to get out and work. The quality of my work is better (change of scenery, people coming and going, etc) and since it’s a blogging perk, I want to take full advantage of it. In my office-and-cubical days I’d have given my right arm to work from Starbucks, and I try to keep that in mind. Great piece. You sound like Tony Robbins…who says that you have to change your state to change your attitude. Hell, you don’t change your state…you caffienate it! That sounds like something Tony Robbins would say, doesn’t it? Some else said “if you do what you’ve always done, you’ll get what you always got” (maybe Tony Robbins again!). But I think there more than a little truth to it. You have to get out and do things differently, and if that means changing your physical location then do it. You really do begin to think differently when you change your environment. Not everyone can find it comfortable to work at the coffee shop, maybe that something have worked with you Kevin and Dave. For others, It’s better to be in a quiet room all by themselves. When writing a blog, it’s better if you are not distracted by people coming in and going out. So you can totally focus on your research and your writing as it is the best way to write a good quality blog content that helps their readers. Hi Matt–It’s definately a matter of preference–different strokes for different folks. But you have to admit it’s a nice option to have! For the most part the quiet room works for me, but in working from home, sometimes I have to change scenery. I think that’s where the inspiration comes from of working from Starbucks, or from any other different location. My friend Dave finds the same thing to be true. In fact, we’ll be working from Starbucks again today! It’s a great way to write a blog while having coffee at a peaceful and non-noisy place. That’s kind of relaxing. I always find a quiet place to read or make blogs and coffee has always been my partner! Hi Ben–coffee, quiet (but not always! ), but for me, it’s mainly about changing the scenery from time to time. Otherwise the home office starts to become a trap! When you’re trying to be creative you have to do what ever you need to do to jump start yourself. That’ll be different for everyone.